Can ibuprofen stop a neuroma from hurting? In most cases your pain associated with a Morton's neuroma is due to inflammation of the nerve traveling through the ball of your foot. Because of this, an anti-inflammatory medication, such as ibuprofen or naproxen, can help to control your pain. This medication can reduce the inflammation surrounding the nerve and stop the neuroma from hurting. When OTC medication is not enough to manage your neuroma pain, your podiatrist in Houston can take additional steps to relieve the pain that the neuroma is causing. Prescription strength anti-inflammatory medication will be more effective to reduce the inflammation and eliminate the pain. 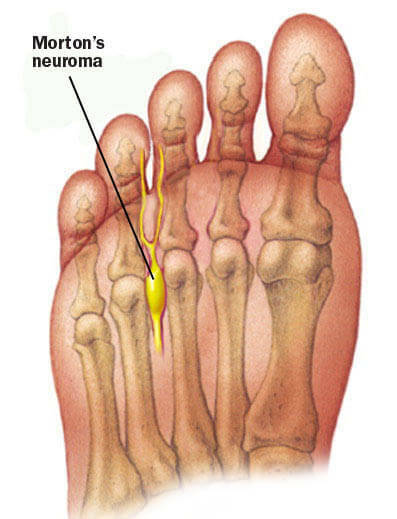 There are many other treatments to stop the Morton's neuroma from hurting as well, including cortisone injections. Don't let ball of foot pain caused by a neuroma stop you from the things you love to do. If medication does not help quickly and completely, be sure to contact our Houston office for a comprehensive evaluation.